Library image #1932: Glacier at Endicott Arm in the Tongass National Forest. The United States Congress designated the Tracy Arm-Fords Terror Wilderness (map) in 1980 and it now has a total of 648,883 acres. All of this wilderness is located in Alaska and is managed by the Forest Service. The Tracy Arm-Fords Terror Wilderness is bordered by the Chuck River Wilderness to the south. Bounded by Canada on the east, this Wilderness is highlighted by two sheer-walled fjords, Tracy Arm and Endicott Arm, both narrow and deep and over 30 miles long. At the head of both fjords tidewater glaciers calve regularly into the sea, making a boat approach to their faces dangerous. Floating chunks of ice, some the size of a three-story building often block access to the end of the fjords, especially in summer. Permanent ice, in fact, covers about one-fifth of the Wilderness. In 1899, a naval crewman named Ford paddled into a narrow waterway connected to Endicott Arm and was trapped for six terrible hours in the ripping tidal surge. Hence the name Fords Terror. Rugged mountains dominate the landmass of the area with steep valleys sparkling with high waterfalls. A young Alaska rain forest of spruce and hemlock grows to an elevation of about 1,500 feet. Wildlife includes brown and black bears, mountain goats, wolves, a few Sitka black-tailed deer, and many smaller furbearing animals. Harbor seals rear their young on ice floating in the fjords, and whales and sea lions are often seen in the water. Bald eagles and shorebirds are common near the coastline. Sea kayaking is popular along the coastline with camping in a few primitive sites. Check with the US Forest Service Juneau Ranger District for maps and information. Day trips to the fjords are available from Juneau by motorized boats and some of these will drop kayakers off at Harbor Island for a fee. Large cruise ships also make regular calls into Tracy Arm. 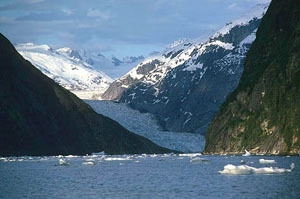 Planning to Visit the Tracy Arm-Fords Terror Wilderness? How to follow the seven standard Leave No Trace principles differs in different parts of the country (desert vs. Rocky Mountains). Click on any of the principles listed below to learn more about how they apply in the Tracy Arm-Fords Terror Wilderness.